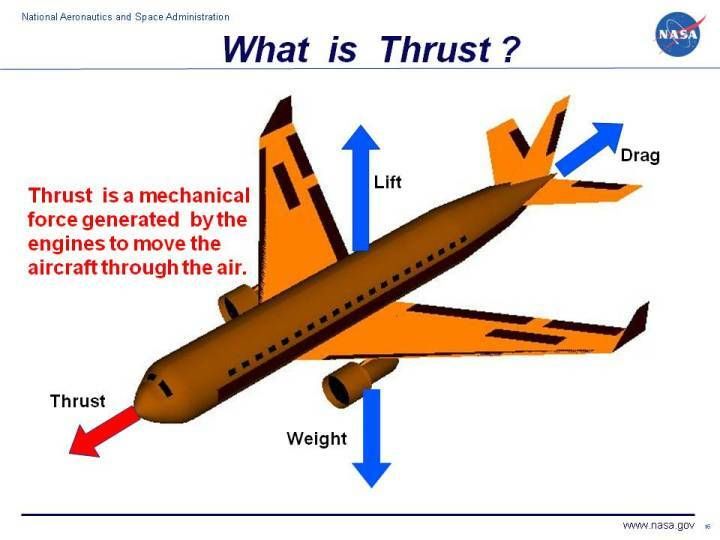 Thrust is the force which moves an aircraft through the air. Thrust is used to overcome the drag of an airplane, and to overcome the weight of a rocket. Thrust is generated by the engines of the aircraft through some kind of propulsion system. Thrust is a mechanical force, so the propulsion system must be in physical contact with a working fluid to produce thrust. Thrust is generated most often through the reaction of accelerating a mass of gas. Since thrust is a force, it is a vector quantity having both a magnitude and a direction. The engine does work on the gas and accelerates the gas to the rear of the engine; the thrust is generated in the opposite direction from the accelerated gas. The magnitude of the thrust depends on the amount of gas that is accelerated and on the difference in velocity of the gas through the engine. The physics involved in the generation of thrust is introduced in middle school and studied in some detail in high school and college. To accelerate the gas, we have to expend energy. The energy is generated as heat by the combustion of some fuel. The thrust equation describes how the acceleration of the gas produces a force. The type of propulsion system used on an aircraft may vary from airplane to airplane and each device produces thrust in a slightly different way. We will discuss four principal propulsion systems at this web site; the propeller, the turbine,or jet, engine, the ramjet, and the rocket. You can view a short movie of "Orville and Wilbur Wright" discussing the thrust force and how it affected the flight of their aircraft. The movie file can be saved to your computer and viewed as a Podcast on your podcast player.